Owning a brand new smartphone is definitely a joy for anyone, but the trick is to make sure that your smartphone remains in as pristine a condition as much as possible, as this always leaves some room for you to actually sell off your handset or get a fairer trade-in value when you would like to make an upgrade. 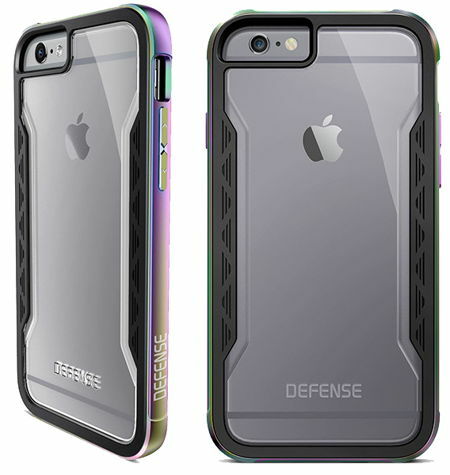 Having said that, the folks over at X-Doria knows this, which is why they decided to expand its family of Defense Shield cases to include the iPhone 6s, thanks to the introduction of its newest style: Iridescent. Iridescent has been specially designed to reflect a spectrum of different hues, as it creates an ever-changing effect for an iPhone that will shift colors as the angle of the case’s view changes. Do not be fooled – Iridescent’s style will not cause any kind of compromise when it comes to protection, as the case itself merges polycarbonate, soft rubber and anodized aluminum in order to form the ultimate in protection for the iPhone 6s. X-Doria has decided to fall back upon machined metal compared to plastic in order to ensure its Defense Shield will be able to deliver military-level drop protection that has been tested to survive 6.6 foot drops on concrete. I seriously doubt that anyone would want to drop their iPhone 6s clad in the Iridescent case on concrete from such a height just to test out such claims, but at least you know at the back of your mind that there is a certain level of safety that we are talking about here. The perimeter of the iPhone 6s will be protected by machined aluminum while the inside will be wrapped with soft rubber, ensuring it achieves protection from drops and making sure that the metal never touches the device. The screen will be protected from drops and surface scratches by an oversized raised lip, and the rear is shielded by a clear polycarbonate, protecting the device without covering it up. The simple snap on construction requires no tools for assembly, so you are ready to get started right out of the box. The asking price for a good looking level of protection? $49.99 a pop.